Accommodation is highly unlikely to become an issue in Corfu, especially if tourists are not as constrained by budget as to be forced to look for cheaper solutions. On the other hand, their taste for splurging is fully complied with by the several luxury hotels located on the island, namely, in Corfu Town and in the few renowned resorts on the island. What is generally characteristic of the luxury hotels in Corfu is that they are fully equipped in view of servicing both the needs of business and leisure travelers, which is why they are opted for all the year round, as the case may be (some of these hotels are opened only from spring to autumn, for instance). Other features may refer, for instance, to a generous number of stylish rooms and suits, great views, conference centers, beauty care centers, close proximity to the beach, own restaurants, facilities enabling various sports activities, room service, beach restaurants and bars and, of course, connection to the internet. Some of these hotels feature children clubs, which is why one might say they also cover the services of family oriented establishments. In terms of luxury hotels, Corfu Town puts forward the elegant Corfu Palace Hotel, the highlights of which refer to the fact that the establishment is opened all the year round and that it benefits from being the one hotel which is best located in Corfu Town (1.5 kilometers from the Corfu International Airport, and 1 kilometer from the beach). Business travelers are taken care of by means of the fully equipped conference center, whereas the indoor pool and the spa are extremely inviting for those who want to spend their time in a rather cannier and healthful way. All in all, the label which covers most adequately the services provided by Corfu Palace Hotel reads that the hotel stands out as one of the finest and elegant hotels not only in the island of Corfu, but from the entire Greece too. The other luxury hotel in Corfu Town refers to Siorra Vittoria Hotel, which lives up to its rating by combining hospitality and a sense of coziness with the creed of hosting its guests in the most exquisite circumstances. Starting with furniture and ending with the personal use products bathrooms are fitted with, everything is of the best brand and exhales distinction, delivering an aristocratic treat to clients in search of classy and yet discreet getaways. Everything about Siorra Vittoria comes down to the utmost invitation to cosseting, and its location in Corfu Town comes as a plus, the hotel being 2 kilometers from the International Airport, and only 300 meters from the beach. The Grecotel Corfu Imperial Resort, located in the exclusive Kommeno Peninsula, is only 12 kilometers from Corfu International Airport, and its convenient 12 meter distance from the beaches is most certainly one of the main highlights of this resort. Its reputation goes back deep in the history, the resort being famed as, literally, a royal residence, having hosted both Queen Victoria and Empress Sissy. The resort owns several private coves which border three lovely sandy beaches. All rooms, suits and villas have water views, and each facility the resort is fitted with is a lesson of luxury and good taste. Other highlights of Grecotel Corfu Imperial refer to the easy accessible berthing for yachts and to the associated services, to the huge sun terraces and to its inviting pool, the newly acquired Elixir Beauty Spa, not to mention the six bars and restaurants serving the finest selection of products in terms of cuisine and drinks. Guests of Grecotel Corfu Imperial know that luxury comes with a price, but they also lean that a stay to this amazing establishment is worth every cent. 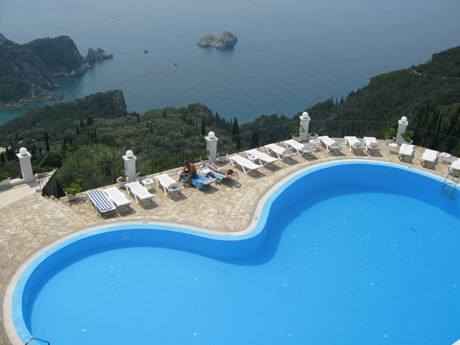 Another prominent presence as far as luxury hotels in Corfu go is represented by the Kontokali Bay Resort & Spa, located only 6 kilometers from Corfu International Airport. The resort is virtually complete in terms of amenities, making available to its guests 3 pools (two of them provided with sea water, and one with fresh water, for children), two beaches and plenty of facilities enabling sports activities, such as tennis, table tennis, mountain biking, not to mention horse riding, golf and sailing, given its proximity to the main centers which provide such activities. Water sports enthusiasts are able to indulge in their favorite activities which refer to water skiing or paragliding. The spa and wellness center is fully equipped for massage, aromatherapy, reflexology, facial treatments and hairdressing, not to mention revitalizing treatments and anti aging treatments. Obviously, this 5 star resort is more than able to comply with all standards and demands in terms of splurging and variety of comfort. All in all, anyone can realize Corfu is more than well endowed when it comes to luxury hotels and resorts, establishments which put forward the additional formula of luxury, class and comfort superimposed on the natural beauty of the island, only to make Corfu a destination which does not fall short from its assigned label of a genuine tourist paradise.